The driver of my red-cloth-covered pedicab is trundling along on the Beijing street, threatening to go right past where I wish to get down. My brain is scrambling for the right Chinese words to tell him to stop, but what it comes back with are words in Malayalam!! This takes me completely by surprise. Malayalam is a South Indian language I learned while studying in Kerala, South India, and haven’t used since for about twenty years now. I thought I had forgotten most of it, but apparently not! It’s making a reappearance in my conscious brain twenty years later. In China! What is dredging up this language long left dormant in my brain? Apart from one common word, ‘Ni’, that coincidentally means ‘You’ in both languages, there is no obvious connection in my mind between the two languages. Clearly though, my brain is filing Malayalam and Mandarin in the same folder. But why is that? It’s not as if those are the only two different languages I know. Growing up, my first spoken language was Hindi, and my first written language as a toddler at the age of three, was English. Additionally, I also picked up Punjabi and Paharhi — two other languages commonly spoken where we lived in India. So why did my brain choose to retrieve Malayalam out of the entire deck when scrambling for Mandarin? When I wanted to shout ‘Stop here’! 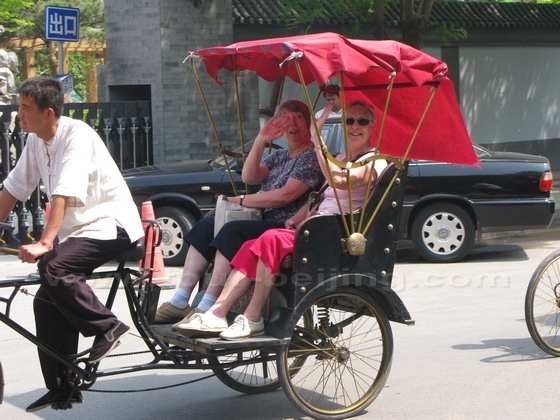 to my pedicab driver in Chinese, why did my brain hurriedly replace it with ‘Ivde nirthoo’ (Malayalam), and not ‘Yahan ruko’ (Hindi) or ‘Etthe rukko’ (Punjabi) or even ‘Hiyaan ruki javo’ (Paharhi)? Internet research did not provide a direct answer (references included below). But some findings related to our age and our brains do make it seem that I shouldn’t be too surprised. Before I set about learning Mandarin, Malayalam was the only new language I had learned as an adult, while all the other languages were picked up in childhood. Apparently, there is a big difference in how we learn new languages as a child versus as an adult. So different, in fact, that the first is called ‘language acquisition‘ while the latter is called ‘language learning‘. A child will acquire a new language or multiple new languages, simply by being exposed to them, without any need to be formally taught the grammar or structure of the languages. As an adult, on the other hand, one must learn a new language by memory, repetition, and an understanding of its grammar and structure. Even then, it’s rare for an adult to achieve native fluency in a ‘learned’ language. Scientists have found that this is because a child’s brain is physically and functionally different from the adult brain. As a child, our brain is highly elastic with no fixed compartments and twice as many synapses as an adult, and the entire brain is used to process the new languages we are exposed to. Starting from about the age of two, until we reach puberty, the brain slowly starts to lose unused synapses and compartmentalizes its functions to different areas of the brain. The period between ages three and five is therefore considered the critical stage for acquiring a new language. By puberty, many of the synapses are dead and the language center is fully compartmentalized on the left side making it much more difficult to naturally acquire new languages. Going by these findings, one can understand that Malayalam and Mandarin would certainly be absorbed differently by my adult brain as compared to the languages acquired in my childhood. But one could also infer that by puberty, all the acquired language related information would have migrated to the left brain’s language center, the same center where new learned languages would be stored in the future. But my own experience tells me that my acquired versus learned languages are certainly being retrieved differently. One possibility would be that while the languages we learn as an adult are probably stored in a specific language center in our left brain, the languages we learn as a child don’t necessarily migrate wholly to the language center as we approach puberty, but rather, leave traces in the ‘intuitive’ right side of our brain. After all, we feel in those acquired languages. I would love to be able to see an MRI scan of my brain when I was answering a basic question in English, versus when I was trying to construct a sentence in Malayalam or Chinese. Would the brain light up in the same area for acquired versus learned languages? (My guess is, it won’t). It also made me wonder, do adults who show better intuition in using new languages (N type in the Briggs-Meyer personality type) have their brains as firmly compartmentalized as their opposite Sensing cousins (S type in the Briggs-Meyer personality type). This again would be fascinating to test using brain scans. Would the brain of an N-type light up the same way as the brain of an S-type while attempting to access a learned language from their brain folders? These are, of course, just interesting hypotheses/questions until a linguistics research lab decides to follow up on them. The direct answer to why my brain scrambles only Malayalam and Mandarin may lie in a wholly different place. But one thing that is clear from the currently accepted research is that those two languages are both firmly dumped in that same sticky post-puberty bucket in my head! As an expat in China, I look around me and see myself surrounded by people from all nationalities, several of whom have spent significant chunks of time abroad in various countries. I wonder if their language retrieval experiences are similar to mine in terms of acquired versus learned languages? As the mother of a 3-year-old who is at the critical age to acquire new languages and who it seems will pick up Mandarin in a completely different, and hopefully much better, way than I will, I am even more fascinated by the direct applicability of these concepts. A couple of other research findings were fascinating as well. Interestingly, all children will naturally acquire a language equally well. However, adults have significantly different language learning capabilities — some virtuosos become fluent in dozens of new languages, while others struggle with even one. Also interestingly, learning a new language has little to do with ‘general intelligence’ and depends instead on inherent skill, similar to skills in music or art (again, that apparent connection to the right brain), and good memory which is also not considered part of ‘general intelligence’. Regardless of capability level though, learning a new language has been shown to develop new neurons in the brain and help stave off Alzheimer’s. There’s a good reason to get out and learn a new language, scrambled or not!